Registered nurses play an increasingly critical role in every facet of our health care system, and our Foundation is actively working to foster the next generation of nurse leaders. Our Nursing Internship Program offers a ten-week, paid summer internship to undergraduates attending one of the 21 nursing schools in the greater Philadelphia region that are supported by our Nurses for Tomorrow initiative. Our interns have the unique opportunity to expand their education beyond the traditional hospital-based setting — either in a community based health center or in a health care administrative setting within Independence Blue Cross — and to gain public speaking, networking, and mentoring skills through a series of Leadership Labs. In 2015, we restructured our program around the Competency, Outcomes, and Performance Assessment (COPA) model, typically only applied in graduate-level nursing curricula. This model establishes eight core competencies for nursing, including communication, critical thinking, and leadership skills. To continue to effectively align with the COPA model and have the greatest impact on students’ leadership development, it was important to get an independent perspective on our program’s strengths and the opportunities to improve, expand, and replicate the program. In the summer of 2017, our Foundation asked Dr. Darrell Spurlock, Jr. and Dr. Susan Mills from Widener University’s Leadership Center for Nursing Education Research to perform an in-depth program evaluation. Through in-person interviews with the 24 interns participating and their site supervisors, direct observation of the Leadership Labs and final research poster presentations, and pre- and post-internship surveys, one thing was clear: Our program provides a one-of-a-kind learning experience. Something else that was evident from the evaluation is how much our nursing interns can accomplish in a mere ten weeks. 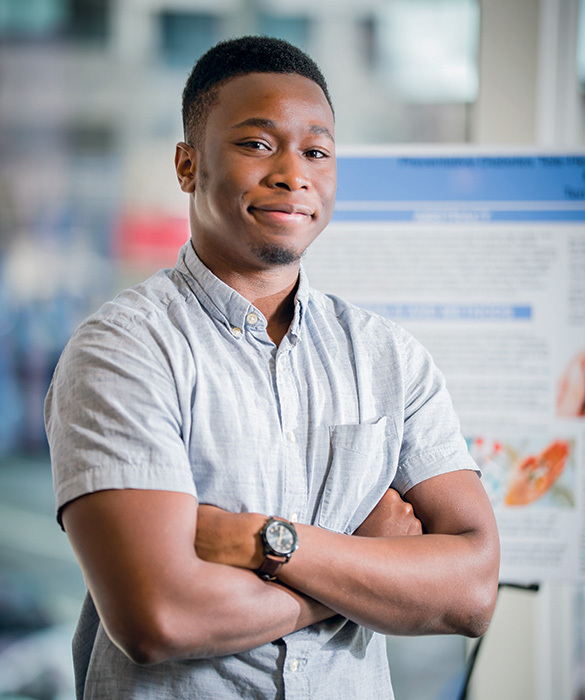 At their chosen internship sites, supervisors encourage them to develop critical thinking skills by sharing and implementing their ideas, which is reflected in their final research poster presentations. They can also clearly articulate how their internship experience has allowed them to view the role of registered nurses in the delivery of health care in a new light. And their experiences have even inspired them to go above and beyond their internship requirements — two of our 2017 interns were so rewarded by their work at a community clinic, they chose to use personal time during their summer vacation to assist at a separate community clinic serving the homeless. Engaging nursing students in community health and preparing them for leadership roles will ensure a strong future health care workforce. 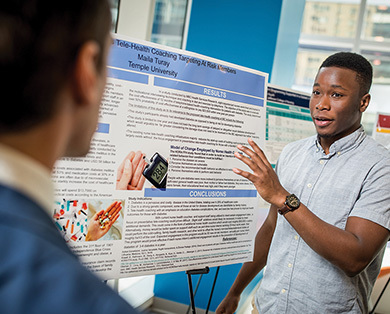 As part of our 2017 Nursing Internship Program, Maila Turay from Temple University presents his research poster on targeting at-risk members through tele-health coaching. Nurses for Tomorrow grants funded scholarships for 420 students at 21 nursing schools in southeastern Pennsylvania.